Is it possible that Hollywood has run out of ideas? One certainly wonders with the release of When A Stranger Calls. The 1979 original, directed and co-written by Fred Walton, was presumably an adaptation of the well-known urban legend that folklorist Jan Harold Brunwand traced back as early as 1971. * Wes Craven paid homage to the famous opening scene of Walton’s original in the Kevin Williamson-written, self-reflexive horror flick Scream. Now Simon West, director of the underrated Lara Croft: Tomb Raider adaptation has remade When A Stranger Calls and stretched the opening scene into an entire movie. Even more bizarre is the fact that a particular shot in his opening scene references Fritz Lang’s M.
The media campaign behind the film is curious also. The trailer clearly gives away the narrative ‘hook’ that has now been shifted to the last act of the film. In fact the opening scene does too, in a strange, understated way. So after all this, what’s left to enjoy? The execution. (Of the film that is; I’m not being morbid). Once the opening titles have finished, West’s film starts out tense and doesn’t let up until the end. In a bold move, once babysitter Jill Johnston is within the gates of the Mandrakis family house, we never leave her side except on one occasion, and only for a few moments. 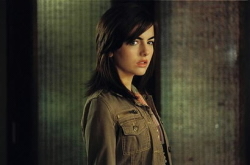 Actress Camilla Belle (who sometimes uncannily resembles Elisha Cuthbert) is the focus of every single scene, and every shot either features her or is from her point of view. Considering this, her performance is extraordinary, as the majority of the film involves walking around the house, moving from curious to apprehensive to terrified. The only two glimmers of subplots in the narrative are quickly forgotten, and I can’t remember the last time I saw a film this unwaveringly focussed on a single hypothesis. The script is fine, but of course there’s no room for any particularly witty dialogue or opportunity for characters to bounce off each other. There are a couple of ‘duh!’ moments, and one or two events that make little sense, but overall the building of the tension is handled supremely well despite the rather sterile narrative conditions. Since I knew the direction the film would take from the outset, the very fact that it inspired anxiety is remarkable to say the least. Sure, a lot of the frights come from overenthusiastic sound mixing, but credit where credit is due. People may be interested to know that Lance Henriksen (AVP: Alien Vs. Predator) supplies the voice for the stranger, not that this is apparent from the miniscule number of lines. We’re given very little information about the menace in this film, it’s very much a case of fear of the unknown, which works, but again only in a bare bones kind of way. This is a shell of a film, but the premise is so masterfully handled that one can’t help but imagine how easily it could have been brilliant, had the script demanded more.